1. 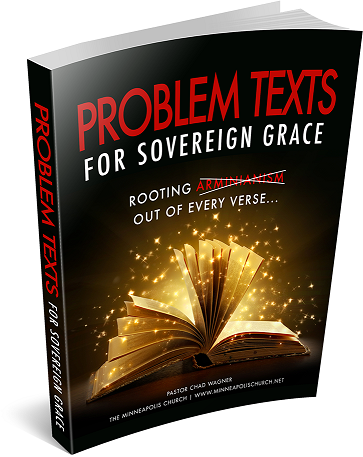 The purpose of this study is to provide both believers, and opponents, of the doctrine of Sovereign Grace with a study which addresses and properly interprets a comprehensive list of verses that are either difficult to reconcile with other verses which clearly teach sovereign grace, or are commonly misinterpreted to support decisional regeneration, works-based salvation, etc. 2. It is necessary to first have a fundamental understanding of the rules of Bible interpretation and also of the doctrine of grace before addressing problem texts. 1. The Bible's rules of Bible study. iv. Therefore no interpretation (explanation) of a prophecy (divinely inspired utterance or discourse) of the scripture can be withdrawn or separated from the rest of the body of the scripture, for to do so would create contraditions. i. The Bible is written so that all the information on a given topic is scattered "here a little, and there a little" all through the scriptures (Isa 28:9-10). iv. This is how the Holy Ghost teaches and so ought we (1Co 2:13). a. An example of a proof text would be: Joh 5:24.
a. An example of a reference text would be: Rom 10:13.
b.	Rom 10:13 states that a person who calls on the name of the Lord shall be saved. Since the Bible speaks of more than one type of salvation, the question then needs to be asked, "Saved from what?”. The text doesn't say what type of salvation is being spoken of, it merely refers to a salvation and would need compared with other texts to define what it is. iii. Pay attention to the context of the verse in question. a. Text without context is pretext. b. Consider to whom the book or epistle was written. c.	Was it written to an individual, a church, or the entire human race? 1. Don't read 1Co 12:27 and conclude that the entire human race is the body of Christ. 2. Don't conclude that "all believers" collectively the body of Christ. 3. The epistle was written to the church at Corinth (1Co 1:2) and therefore the text is stating that their local church was the body of Christ. 4. Then it can be deduced that each local church is the body of Christ. e.	Always read at least ten verses around the verse in question before beginning to interpret it. A. When Adam sinned, he died spiritually and plunged all of his descendents into sin and spiritual death (Gen 2:17 c/w Gen 3:6 c/w Rom 5:12). B. Because sin and death passed upon all men, all are therefore born spiritually dead (Eph 2:1). i. Being righteous (Rom 3:9-10); in fact they are free from it (Rom 6:20). ii. Hearing God's words (Joh 8:43,47). iii. Understanding the gospel / spiritual things (Rom 3:11 c/w 1Co 1:18; 1Co 2:14). iv. Believing in Jesus (Joh 10:26 c/w John 10:28). v.	Seeking God (Rom 3:11). vi. Doing good (Rom 3:12). vii. Fearing God (Rom 3:18). viii. Being subject to the law of God (Rom 8:7). ix. Pleasing God (Rom 8:8), which includes believing in Jesus (1Jo 3:22-23). E.	How many men in their natural state of spiritual death in sins who cannot hear, understand, or believe the gospel, nor seek, fear, or please God, would choose to accept a conditional eternal salvation from God by hearing, understanding, and believing the gospel? Answer: None (Rom 3:9-12). F.	Therefore, if any man will be saved eternally, it must be by God sovereignly saving him. A. God, knowing that man would fall into sin and be incapable of redeeming himself, foreknew (1Pe 1:2) and chose some of them out of the fallen lump of mankind and made them vessels of honor (Rom 9:21-23). B. This is called election (Rom 9:11; Rom 11:5). C.	Election - The exercise of God's sovereign will in choosing some of His creatures in preference to others for blessings temporal or spiritual, esp. for eternal salvation. D.	God chose His elect before the foundation of the world and gave them to Jesus Christ die for and give eternal life to (Eph 1:4-5; Joh 17:2). E.	Since God's choosing of His elect was long before they had any say in it, and since it is not based on their will or works (Rom 9:11,16), it is therefore unconditional election.